Find out the new way to manage your dental practice in Cloud. Smarter, Faster and Convenient. The new dental practice management software. The Digital Marketing Manager that suggests services and treatments in the waiting room. The complete software for cephalometric analysis, a CE marking mediacl device for Mac. Create fast and precise tracings with OrisCeph Mac Rx3 CE. The global support for your IT system, remote backup and updates. Experience and innovation at the service of the dental clinic. A new modern and ergonomic design, new advance functions for the digitalizations of documents. GDPR: with OrisDent it is easier. The adjustment is included for all users with an active support contract. check list to help you in the compliance process. to realize quick and accurate tracings as well as planning orthodontic treatments..
safety and quality, available for Windows and Mac. “We decided to computerize our dental practice in order to better manage our daily activities. Since we use OrisDent we have given a modern and efficient image to the clinic (we have more than 10 work stations) and we can manage easily all our patients’ record and dental chart. The software is easy to use and all the staff is able to use it thanks to the training course we have followed. Since we use OrisDento we have improved our business and the management of our Practice”. “We at Smiledesign dental center strive to provide the best for our patients. This statement not only includes having the best dentists, the best supporting staff and the best equipment there is. It also includes the best in patient management software, that is why we searched carefully before coming to the conclusion OrisLine is the best in the market. We have used it for over 3 years now as a patient management software, as an inventory software and even as our accounting software. We simply love it”. 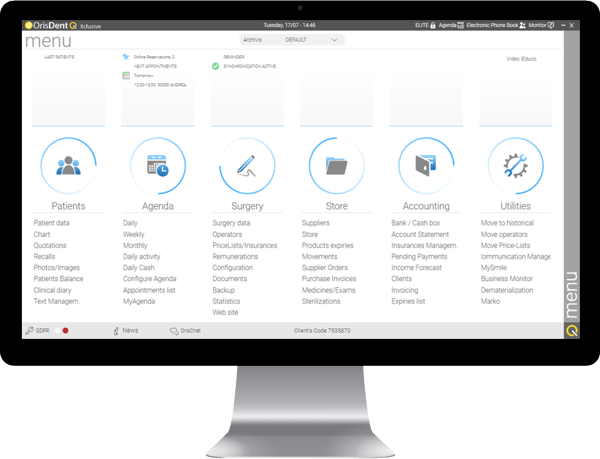 “OrisDent evo is simple to use with all-in-one package of patients data, appointment, accountant and monthly report that every dental office needs. We used the support service for the first year, the service is good, however OrisDent evo is a stable software, so only sometimes we called for support”. 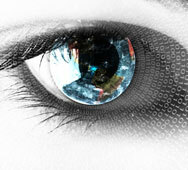 With OrisEduco3 HD you can realize an interactive quotation to make your patient aware of the treatment benefits. The patient will easily understand the treatment suggested and will be more likely to accept the quotation. Hundreds of animations in high definition to explain the treatment in a clear and efficient way. Try OrisLab X3 for the management of your Dental Laboratory. Save time and money with the dental technician software OrisLab X3. intuitive graphical interface and quick and easy commands. Manage easily, efficiently and quickly your Dental Laboratory. Organize your storage and the lots numbers in a simple and accurate way through automatic load/unload movements. Your Agenda always at your fingertips. your Practice from smartphone and tablet. 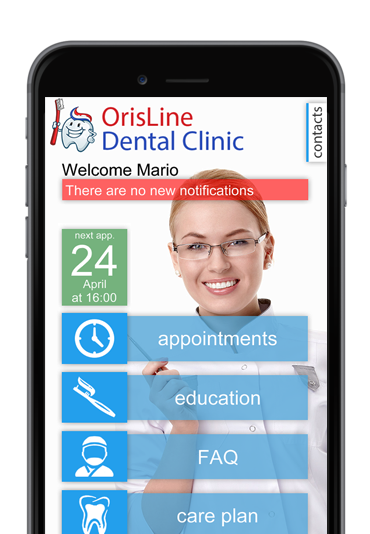 with your Dental Practice to communicate with them at any time and from any location, directly on their smartphone. New promotions, closing hours of the practice, birthday wishes… all this with a simple click! Do you want to change your old software?